Now that the housing market has recovered and is back to pre-recession levels with housing values on the increase, the money is starting to flow back into the market again in terms of homes that may need a little or a lot of work. 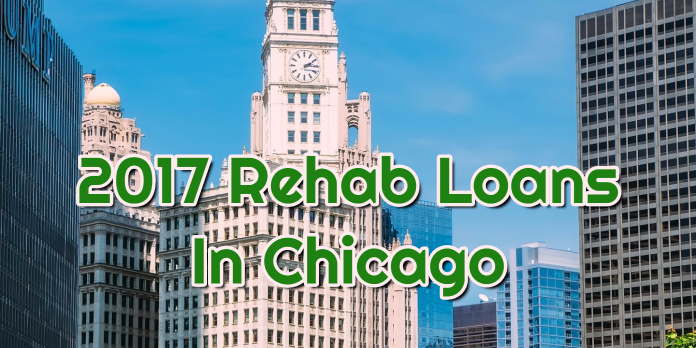 In this article we are going to look at the options for 2017 Rehab Loans In Chicago and also the different loan limits across the great state of Illinois so that as a potential borrower, you will know exactly what type of limits you can expect for potential loans. The first type of loans that come to mind when you are talking about 2017 Rehab Loans In Chicago is the FHA or Federal Housing Authority’s 203K program or FHA 203K for short. Now to begin with the FHA or Federal Housing Authority is a government agency under HUD (US Department of Housing and Urban Development) that sets the standards and insures loans for banks and lending institutions. Now if you are looking for a home that needs repairs or if you have an existing home that needs repairs, the FHA 203K program has a few different options for you to choose from in order to get your goals accomplished. The FHA 203K program is known by its common name of a “fixer upper loan” for the fact that as the name states, you are going to receive funds against the homes equity in order to get projects done within the home. However, you have to remember that this is NOT a cash-out loan and all funds must be used for the housing rehab and repairs. You can choose to purchase an existing home on a plot of land and get the rehab funds to repair it. You can use this loan to purchase a home on a different plot of land, move it to a new plot of land, and then repair it. You can use this loan to refinance an exisiting home and then get the funds to repair it. The first of the 2017 Rehab Loans In Chicago is the FHA 203K Standard. This rehab loan has a loan minimum of $5,000 but there is no limit to how much you can borrower as long as you conform to FHA Loan Limits for your area. For example in the Chicagoland area you can expect to find FHA Loan Limits of $365,700 in the city and in the surrounding counties of Chicago. However, once you get outside the surrounding counties, you will see the FHA Loan Limits drop to $271,050. Let’s say you find a home that needs some work for $250,000, you are able to borrow up to $115,700 in construction and rehab costs and have this all under 1 FHA 203K Loan which would be a max value of $365,700. Now the one caveat in all this is that the value of the home after the repairs must support at least the amount of the loan which is on the home. If it is determined that the repaired value is less than you’d like, it will reduce the amount of rehab funds available to you in this product. Types of projects that would be included under this loan would be: Relocation of load bearing walls, putting an addition onto the existing home, landscaping the property, repairing structural damage in the home, and in general any major projects that exceed $35,000. The second of the 2017 Rehab Loans In Chicago is the FHA 203K Streamline loan. This loan is for the smaller projects you can come across as the loan minimum is still $5,000 but the maximum loan amount is only $35,000. With the Streamline product, the loan itself has a lot less paperwork than a standard 203K and is a simpler loan to manage if you don’t plan on doing large projects. Examples of projects you can take on with a Streamline Loan is: HVAC repair and replacement, roof repair and replacement, non-structural repairs and basement finishing, or any other small projects. The final of the 2017 Rehab Loans In Chicago is Fannie Mae’s Homestyle Renovation Loan. Now this loan is not nearly as prominent as the FHA 203K loans, but the basics of the loan is the same. With this loan you are obtaining just one loan in order to purchase a home and repair it. With this loan, just about any repair is included as long as the repair is permanent and adds a value to the home. As with the FHA variety, you cannot receive any left-over funds as this is not a cash-out loan either. The only contingency for this loan is that you must complete all repairs and projects within 12 months of closing on the loan. Loans under the Homestyle Renovation Loan abide by Fannie Mae and Conventional Loan standards so you will need a minimum of 5% down payment in order to make this loan happen. Illinois Loan Limits are good for you to know if you are interested in the 2017 Rehab Loans In Chicago. As we touched on earlier, the FHA Loan Limits for Illinois are $271,050 for most of the state of Illinois, however in the Chicagoland area in the counties of Cook, Kane, DuPage, Will, Dekalb, Grundy, Lake, and McHenry the FHA Loan Limits are $365,700. These higher loan limits are due to the fact that the housing values in these areas are a lot larger than the less inhabited portions of the state. In terms of Conventional Loan rates, Illinois does not have any areas that are considered high cost areas, so the Conventional Loan Limit is $424,100 which is an increase of prior years at $417,000. If you are looking for 2-4 units buildings in Illinois, the limits are as follows: 2-Unit: $543,000, 3-Unit: $656,350, 4-Unit: $815,650. How to Find a Lender To Get 203k Renovation Loan? As you can see there are many different options in 2017 for Rehab Loans in Chicago and Illinois. You can find yourself getting an FHA 203K product or even a Fannie Mae Homestyle Renovation Loan. All loans have their benefits and if you need assistance with a rehab loan, then you need to reach out to Loan Consultants as we have all the answers for you and can get your loan started today. You can reach out to us any time at 888-900-1020 or email at contact@loanconsultants.org. We work days, nights, weekends, and holidays in order to serve you, the customer as best we can. Please reach out today to get started!